04 Mart 2019 Pazartesi 20:02 - 5 reads. 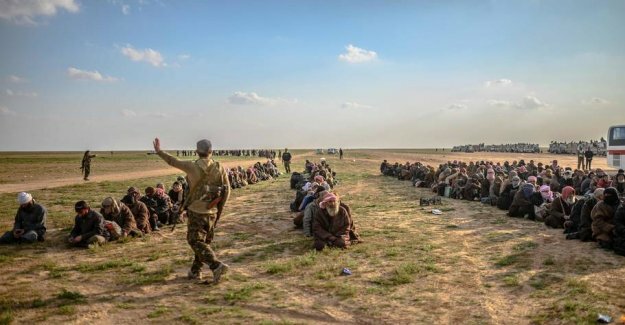 About 150 fighters from the militant group Islamic State (IS) on Monday and turned himself in to u.s. forces in Baghouz. This was stated by The Syrian Observatory for human Rights (Sohr). Baghouz in the eastern Syria IS' last small enclave in Syria. the Warriors, who have surrendered are among a total of 400 persons, on Monday has left the area. It happens after Syria's Democratic Forces (SDF) in recent days has resumed a large-scale offensive against the ICE cream. ICE cream is pretty much defeated in Syria. The group is forced back to a last small area of land in Baghouz of the amerikanskstøttede kurdish forces SDF. ICE soldiers the last few weeks, hiding among civilians in Baghouz. Why has the SDF had a hard time to launch his final assault against the group. on Friday it was reported that all civilians had left the city. However, there are still a few left, wrote the SDF's spokesman, Mustafa Bali, on Sunday on Twitter. - to curb the offensive in Baghouz because of a small number of civilians being used as human shields by Daesh, said the SDF-comforter. - But we assure you that the fight to take over the ICE' last enclave soon is over, it sounded far from Mustafa Bali. the SDF has not confirmed the Sohrs the information that the 150 ICE-soldiers on Monday has turned himself in. It is also not clear how many fighters from IS, which is back in the small village. A military source from the SDF says Monday, according to news agency Reuters, that there remains at least some ICE warriors in Baghouz. Should Baghouz fall to the SDF, it will mark the end of a four-year campaign. It has been designed to complete the IS's control in Syria. the Offensive against Baghouz is the last part in a major operation that began in september last year. The aim has been to remove the last of the ICE cream posts on the eastern bank of the river Euphrates. Honey, what are we watching today?